Perfect mid point location on the way to Vung Tau City where is just about 40 minutes by car from Ho Chi Minh city. Hidden away among luxuriant golf greens, tropical landscapes, the Long Thanh Golf Club is a must see for golfers looking to escape from the hustle and bustle of Saigon and step into that country lifestyle without being hours away from town. The branches of Dong nai river link the club to HCMC so you may travel to the club by boat if you want to avoid the crazy traffic and observe the daily activities along the banks of Saigon river. This great golf course is generously endowed with a naturally undulating topography which is endlessly interesting to play for golfers of all abilities. Long Thanh Golf Club is designed by Golf Plan – the company has been providing golf course planning and architectural services for 35 years in more than 75 countries on six continents. 18 holes out of which are more challenging for professional golfers, and the remaining are ambitious golfers and beginners. The 18-hole, 6933-yard course, which is far more challenging, is constructed on a plateau that offers magnificent panoramic views over the water and countryside, each hole has its specific designation. It features rolling fairways and subtly undulating greens, winding through a palm plantation and artificial lakes with some waterfalls and other beautiful features. Coupled with the cool atmosphere and spectacular panorama, there can be only few comparable places in all Asia in which to play golf with such an environment. 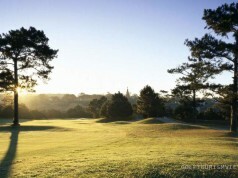 The course offers challenging and rewarding golf amidst spectacular scenery to players of all levels. The 18 hole lake course which measures 7109 yards, is surrounded by the branches of Dong Nai river that offers cool breezes to this area. 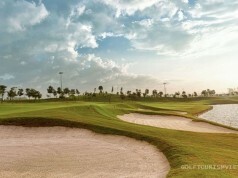 Lake course has a good design with international standard light system for night golfing. All night the course looks like having a new fanciful romantic wing. The grass for the course is species Paspalum dedicated to golf courses, which not only helps golfers make exact shots but also contributes, combined with the landscape and cool climate herein, to the players’ feeling the value of absolute relaxation. Long thanh golf possess a broad training ground so that customers can start before the play, moreover, also the vietnamese staff experienced golf tutorial exercises. Training ground without grass, artificial carpets which can play on real grass as playing on the golf course. Address: National Road 51, Tan Mai, Phuoc Tan, Bien Hoa, Dong Nai, Vietnam. 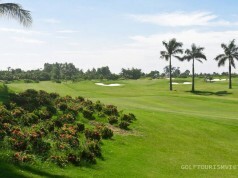 Keyword: long thanh golf, long thanh golf club. Woa the photo no.2, so beautiful!! !